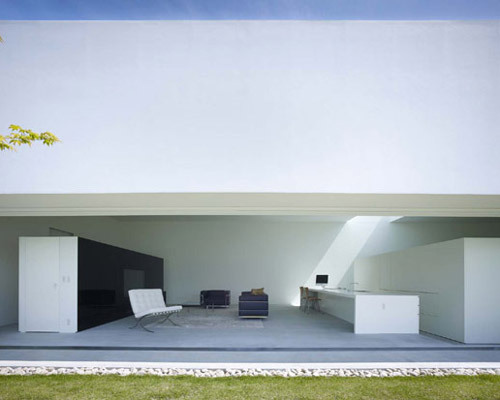 shinichi ogawa and associates specializes in minimalist, clean-cut spaces. shinichi ogawa is currently a professor at the kinki university of engineering as well as a visiting professor at the edinburgh college of art – school of architecture. located in a suburb of hiroshima, japan, ‘warehouse’ by local architecture firm shinichi ogawa and associates is a single volume residence with an enclosed courtyard. distilled to its simplest form, the domestic programs of the house are arranged in a linear orientation in a ‘one room space’. to create loose boundaries and order to the open concept, the design incorporates subtle level changes in section: the ‘wet’ programs such as the kitchen and bathroom are stepped down from the living area, while the washitsu (japanese-style room) and office are placed half a level lower to the entry way. another key element to the formalization of space is the series of functional furniture arranged like a barcode throughout the length of the space. these free-standing wall units with built-in functions–closets, toilet, kitchen appliances–provide privacy for the bedroom while enclosing the study and japanese-style room. a mezzanine area is also created above, becoming an open play space for the kids. the expansive courtyard on the south side of the house is enclosed by a frosted glass fence. the interior is capable of opening up completely to the outside by a series of sliding doors. Love it! otsukare yasu, sho, takaaki, ishimoto! where do you bathe and shower? Everyone must share 1/2 a bathroom? The house can likely be closed to the outside, so rain probably isn’t much of an issue. Privacy is, though. It would be hard on parents if your kid could always look down on you as you sleep/make more kids. Maybe this is a sweet bachelor pad, but I don’t see this as a sustainable living situation for any kind of family. This is beautiful to look at, but I would have put the kids’ room at the other end of the building, and added doors and full height walls for bedrooms. Moving the living room to up top would be kind of cool, cause then you could see outside over the fence as you chill. I must agree with the bedroom issue, but notihing else, I think that absence of walls going from floor to ceiling is key to this project. I’d rather suggest to change the bedrooms: upstairs main bedroom and ground floor kid’s bedroom. Done! Uau, just like living in an open-space office, with all the booths and all. I love the height adjustments to differentiate the spaces. Subtle and clever. Fantastic, as usual for Ogawa. I miss only the garage for a vintage Porsche 911…. 100% satisfaction, We offer[url=http://www.cheapchristianlouboutinuk.com]cheap christian louboutin shoes[/url]and[url=http://www.nbanike.com]NBA Dunk Shoes[/url] at lowest price .welcome to order them.